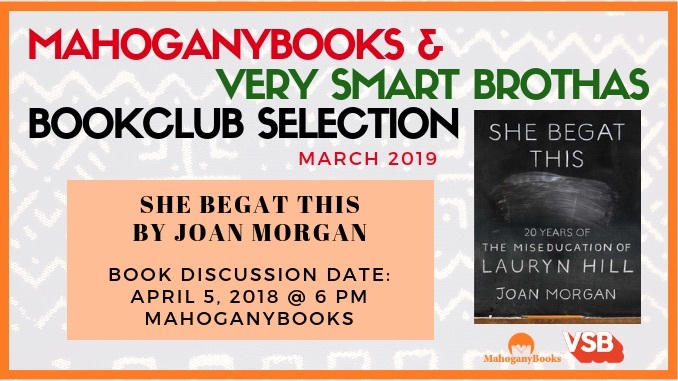 The MahoganyBooks & Very Smart Brothas book club is excited to announce our March book is none other than She Begat This: 20 Years of the Miseducation of Lauryn Hill written by Joan Morgan. Recognized as 'An NPR 2018 Great Read,' "She Begat This celebrates the twentieth anniversary of the acclaimed and influential debut album The Miseducation of Lauryn Hill with...eye-opening and moving exploration of Lauryn Hill and her remarkable artistic legacy." Written by "award-winning feminist author and journalist Joan Morgan delivers an expansive, in-depth, and heartfelt analysis of the album and its enduring place in pop culture. She Begat This is both an indelible portrait of a magical moment when a young, fierce, and determined singer-rapper-songwriter made music history and a crucial work of scholarship, perfect for longtime hip-hop fans and a new generation of fans just discovering this album." Join the MahoganyBooks + Very Smart Brothas Book Club on April 5, 2018 from 6:00 PM to 8:00 PM for what promises to be a fun, controversial, and engaging conversation about a book paying homage to the impact Lauryn Hill and her "classic hip-hop album" had on Black/American culture. You can participate live at MahoganyBooks or join us online for live-streamed conversation.